Thanks for sharing... Fascinating!! Never seen one like it before although I have seen that Maui coverplate. The engraving / engraver on the body looks very similar to that on the Silvatone that I have. Where are you? Most of CB's guitars turn up 'round Toronto, Canada. I'd love to hear where this one came from. I think there are too many Brashers about to be 'just made for band members' certainly a dozen + so that I know of. Bryan Bradfield probably knows more about this than any one else, try PMing him.. Celebrating the genius of the Dopyera brothers. Tubertone: What a wonderful and unusual-looking find. And I love that position dot at the 16th fret! Unfortunately, I’ve never heard of George Duncan. Steverino: The R.S. Williams connection is correct. Colin: I believe that Brasher added the cone and cover-plate himself, based on the crude opening that was cut into the top of my wood-bodied instrument. Furthermore, the intonation on mine was “suspect” and very un-luthier-like. However, for Hawaiian playing, it could be considered OK, I suppose. I also believe that the wooden bodies were made to be converted to resonator guitars, based on the location of the sound-holes in the upper bouts of the wood bodies, and the lack of bracing in the area where the hole was to be cut. I (perhaps) optimistically identify my wood-bodied model as having belonged to a Brasher band member based on the oral history provided by its previous owner. This previous owner lived in Southern Alberta, and acquired the guitar in 1947 from a former member of a Toronto-based Hawaiian band. The guitar was supplied to that band member, then living in Toronto, to play in the band. Brasher was operating a band from the early 1930’s until well after the end of the second world war. I believe that wood-bodied instruments headed for retail market were marked with headstock decals, and mine, the (possibly) former band member’s instrument, has no headstock decal. this Brasher came from the Niagara Ontario Area , I would love to find out how many were made ?....the engraving on this MAUI could possibly be same engraver for the Silvatone , the style and approach are very similar to the art on both . This Reso does have a bash on the bottom/side bout and pings/dimples but can be repaired with some passion,prayer and patience . The neck has a warp and needs a nut but I know I can repair this so this will be a great instrument again . .....the George Duncan ?....makes it more interesting for me , I can only imagine what its been through after all these decades to get here today . It has my respect already . Hello Bryan Bradfield-- The dot inlay at 18 fret is from an old repair as well as at 21 fret and done rather sloppy but these can be corrected . I have a project on my hands ! ( but only after I enjoy playing it some more ) and '' satisfied '' as Muddy would say . cause I was born and raised in Toronto and know some people who know some people who know some people .....I guess I can start there and maybe find more info . I will post what I find on this cool site . 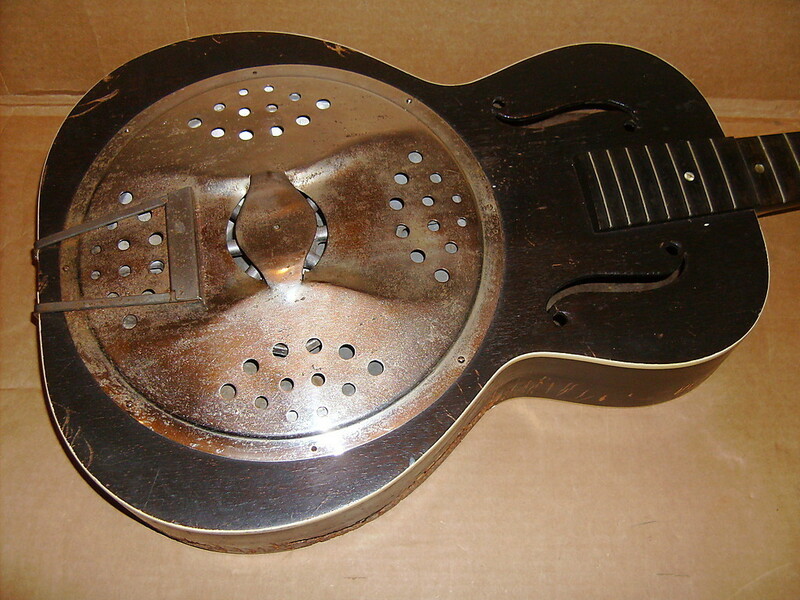 Old thread, I know, but I just bought this guitar on eBay and wanted to ask you if this might be a Brasher resonator. The coverplate is surely of Brashers manufacture! It's in bad shape but I'll fix it and try it out, this one's a spider bridge, perhaps not original.. We'll see when it gets here! I haven’t been paying too much attention to Brashers in recent years, but your cover plate strap shouts Brasher to me. On the other hand, I can’t recall seeing round holes in Brasher cover plates? The f-holes appear correct for an Arthur Hansel guitar. The spider bridge appears to be Dobro, and that conversion to a Dobro cone and spider is relatively easy in these guitars. However, the cone in the picture does not look like a Dobro cone to me. Once you take it apart, if you decide to, I’d like to see a photo of the cone and spider, and a photo of the neck stick extension inside the body, and a photo of the back of the head-stock. Hansel had a unique neck stick extension, as well as a unique look on the back of the head-stock. I currently believe that Arthur Hansel built the bodies, complete with the requested head-stock decal, and furnished them to the R.S. Williams Company. The company then provided them to Ted Brasher who cut the hole for the cone, stamped the cone and cover-plate, and finished the construction. Then back to R.S. Williams Co for distribution. I suppose it is possible that Hansel and Brasher worked together; however, Brasher’s daughter never mentioned another builder to me. She did mention visiting a guitar shop in Toronto with her father, and the thing that most intrigued her was a shiny black Gibson that was hanging on the wall. Hi Bryan, thanks for your input! I agree that the coverlate seems like a Brasher, over at Notecannons there is a model with a similar coverplate. I will check things out when I start the repairs, seems like there is a half neck stick, more or less like the Regal Dobros could have. 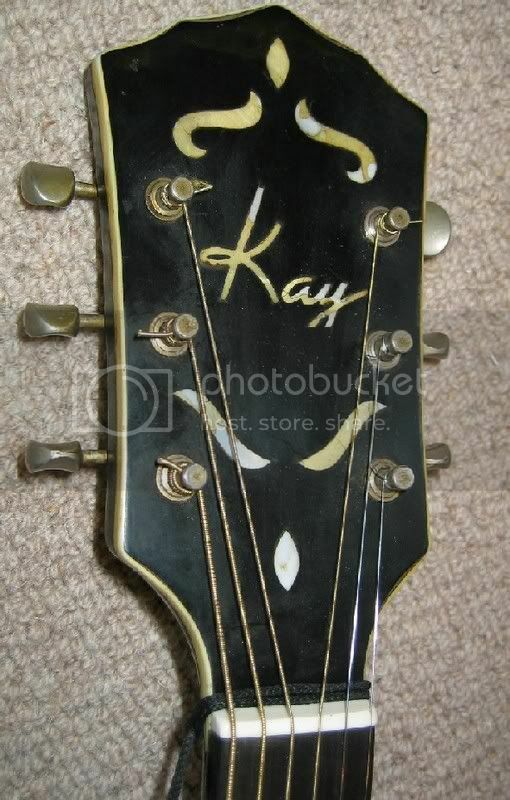 Also the back of the headstock does seem a bit unusual, we'll see what I can find out once it's here.. It's a cool reso imo, will be fun to play it!! OK, I see the Notecannons example with the round sound holes in the cover plate. The little bit of neck rod extension seen in that same guitar is very much like the extension in my Hensel/Brasher. In my guitar, the Brasher cone was held in place by the tension of the cover plate clamping down on the edge of the cone. The example in Notecannons appears to have additional screws hole in the cone, as though the cone was screwed in place, with the cover plate then screwed down over the cone. Or did the cover plate screws go through the cone as well? It beats me. Brasher never stood still. There is no separate ledge for a Brasher cone in any of these guitars. For me to successfully install a Quarterman cone with a #14 spider, I simply enlarged the Brasher opening sufficiently, and glued a ledge beneath Hensel’s 3/16” laminate top. My ledge is a 1/4” laminate, about 5 plies as I recall. It'll be interesting to see what the cone is like in mine, if the spider set-up is original then we might have a new type of Brasher model. We'll see.. Most likely it's a Dobro cone and bridge! And based on what you see, is this a Brasher guitar? My references are to the bodies made by Arthur Hensel. The transitional contours from the rear of the Bottleneck John headstock into the neck don’t look right; however, there is a splice there from a repaired break, so there may have been some wood removal during the repair. The f-holes don’t look right to me. The f-holes on the Notecannons Reliance are like those in my instrument (Hensel), and are different from the Bottleneck John example. The presence of a dot at the fifteenth fret strikes me as unusual. In addition, the dots appear to be pearl. The dots on mine were originally “linoleum”. The tailpiece on the Bottleneck John example is unusual. I’ve only seen tailpieces like the one on the Notecannons Reliance for the wood body Brashers. However, the Bottleneck John tailpiece could be a replacement. Yes, the Notecannons Reliance cover plate is identical to the Bottleneck John example, and that strap cover is undoubtedly a Brasher feature. Right now I’m leaning toward this being a guitar that Brasher put the cover plate onto, but the guitar was built for R.S. Williams Company by someone other than Arthur Hensel, which I consider to be a rarity. 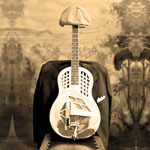 I’ll be interested to see the neck stick extension, the cone and spider assembly, and finally, the way in which the Dobro parts were installed in the body. The tailpiece has been replaced, I can see there's markings after another one. I like this, a tiny reso-mystery.!! When it gets here, I'll provide you with some good pics of the details and we can try to figure out who built it.. It'll take a LOT of work but it'll be ok.. The Brasher coverplate, really nicely stamped, the nickel once was a well done job, second to none I'd say. The cone! If this is NOT a Dobro manufacture then it's a fine copy!! Most likely it haven't been opened before... A real mess under the cover.. Cone looks original to the guitar. Radiused fretboard, looks to me like ebony not just "ebonized". The half neck-stick! Much like Regal Dobro's..
Closer inspection tells me that this IS the original tailpiece! OK, just a matter of making this one sing once again....!!!!!!! Not a lot of holes in the soundwell to let the sound into the guitar body, no ? How about a few extra holes in it !!! I agree!! But they've must have had some thought behind it? I'll have to open it up anyway to make the repairs, so there'll be bigger holes. We'll see if I cover them up after it's been fixed. Kinda fun to keep it original since it's surely unusual..
What about the holes in the cone? I have never seen that? Is it common on old Dobro cones? Bryan, any ideas or thoughts?! They are the same as in the 8 lug I had. ... minutes ago zak71 said "you're right."